Downtown LA is in a high state of transformation. One can see construction sites everywhere (about one hundred on-going projects.) From high-rise offices, hotels and condominiums to low rise affordable housing; long neglected buildings are being rehabilitated; younger people come to live in downtown, crying out for a lifestyle that does not involve long commuting time. There is still much cacophony and incongruousness in a complex area of 50,000 residents that could accommodate, at least, 500,000. Yet the Renaissance is on the way. There is a new spirit one can feel when walking along Spring Street or going for a chic dinner in the Art District. 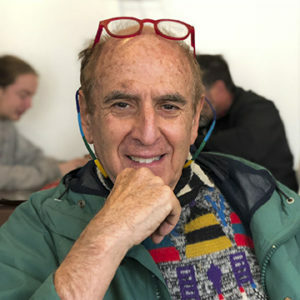 “I always joke that downtown is an overnight wonder that I’ve been working on for 17 years,” said Hal Bastian, responsible for generating investment interest in downtown and recruiting businesses to the area. 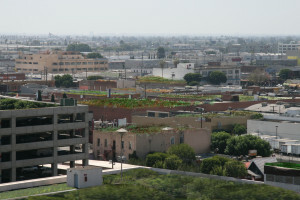 Within the context of so much transformation in the making, Ruth Meghiddo (the name sounds familiar) decided to be on the front-line of the urban “fifth facade:” downtown’s rooftops. The breakthrough happened in the Santa Fe Lofts, a 170-unit apartment building built in 1906, on the corner of Main and 6th Streets. She challenged the owners to pioneer food-growing on top of the building as an additional amenity for the building’s residents. They agreed. To make it happen, she brought in the “building brick” of her urban farming: Tower Gardens. Fast backward: In 1979 there was a world energy crisis due to OPEC members’ manipulation of oil pricing and production for political ends, led by Saudi Arabia. Long lines appeared at gas stations. A recession was triggered. Since the delivery of food from the farm to the city depends on transportation, an energy crisis also implies a food-supply crisis. To practice what we preached, we built our house and studio in Westwood, on Rochester Avenue, based on “energy-conscious design” principles (the word “sustainability” had not become yet part of the general vocabulary.) It was the first house in the Westside’s neighborhood to use solar collectors (imported from Israel) for water heating. Ruth’s “agro-garden” fed us for at least eight months a year. One of the daily rituals was having our daughter going to pick up strawberries from the garden before leaving for school, to put into her lunch box. 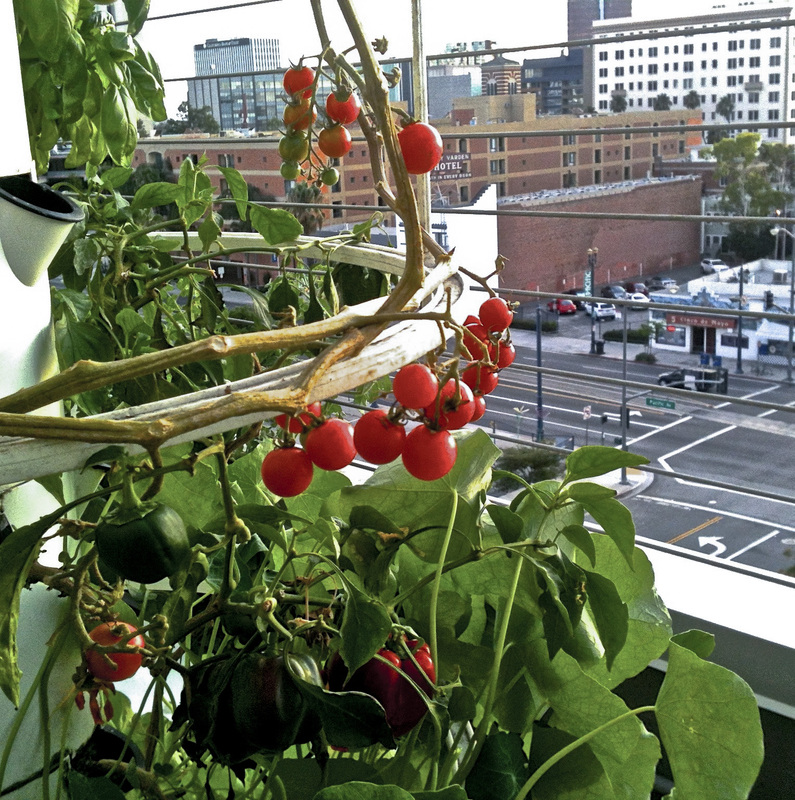 Ruth’s discovery of The Tower Garden’s aeroponic system was a game changer. She realized that its potential use as a building block of urban farming could have far-reaching implications. 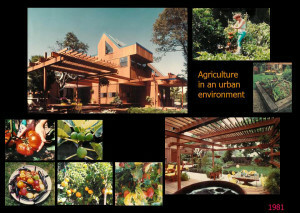 She founded Farm Urbana. The Tower Garden unit has a 2.5′ x 2.5′ footprint and a 20-gallon reservoir base with a small submersible pump for the mineral solution. The nutrient water is pumped to an outlet at the top of the tower and falls into a perforated basket which then drips through the spaces and perforations in the modules, humidifying and being absorbed by plant roots and finally mostly returning to the reservoir. The system uses 90% less water than with conventional gardening. A few months ago Ruth was contacted by Professor Daniel S. Stokols, from the School of Social Ecology at the University of California, Irvine. They knew each other as co-directors of The Architecture Foundation of Orange County. Stokols was interested on what Ruth is doing from the environmental point of view. 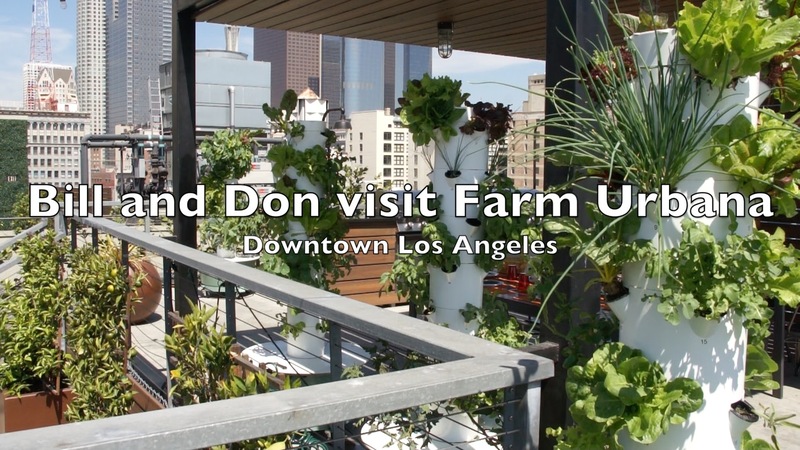 He decided to connect her with professors Bill Tomlinson, Donald J. Patterson and Bonnie Nardi from the Donald Bren School of Information and Computer Sciences and see how urban farming could be linked to information technology. What is that Farm Urbana does that is meaningful to an information technology course? Global Disruption and Information Technology” is eloquently presented at TEDxUCIrvine by Bill Tomlinson. It seeks to help students understand how sociotechnical systems may support a transition to a sustainable civilization. Food production, computational systems to support resource sharing, and localized, low-energy technological infrastructure are at the core of the course’s objectives. 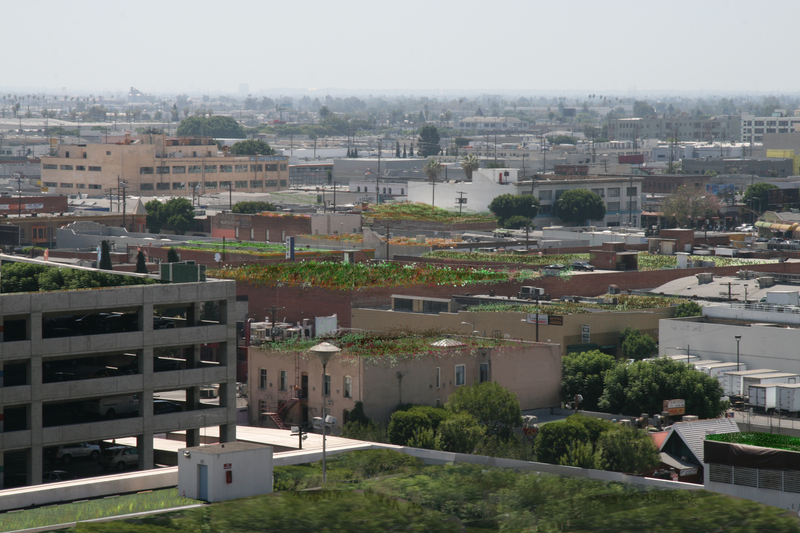 Fast forward into the future: the Santa Fe Lofts installation is to be seen as an embryonic experiment on what is possible: from massive food production on the roofs of parking structures and hundreds of restaurants to provide a daily supply of vegetables, to what apartment buildings and condominiums can have on their roofs for their tenants, in addition to their workout spaces, to what individuals can do on their terraces, their balconies and homes’ yards. Last but not least is having vertical farms as a standard feature of every school.